Born September 28, 1817 in Rimaszombat; died July 30, 1868 in Hanva. Poet. Son of a bootmaker from impoverished line of aristocrats. Parents' death placed him in care of grandparents. Entered Református Kollégium in Sárospatak in 1832 with help of Szentimrey family. Worked as servant to students. Left school in 1838 to become assistant teacher in Sárbogárd. Returned to Kollégium in Sárospatak in March 1839 and completed studies in theology and law in 1844. Poems appeared regularly from 1840 in Athenaeum, Életképek, Pesti Divatlap, and Honderű. Served as tutor in Eperjes, where he began friendship with Sándor Petőfi (q.v.) in 1845. In December 1845 went to Pest, where he became acquainted with József Bajza, András Fáy, Mihály Vörösmarty (qq.v. ), and Ferenc Toldy. Considered becoming lawyer and remaining in Pest but accepted ministry in Beje in 1846. Member of Kisfaludy-Társaság in 1847. Moved to Kelemér in 1849 and Hanva in 1851, where he remained until his death. Married Emilia Zsoldos in 1849. Formed close friendship with János Arany (q.v.) 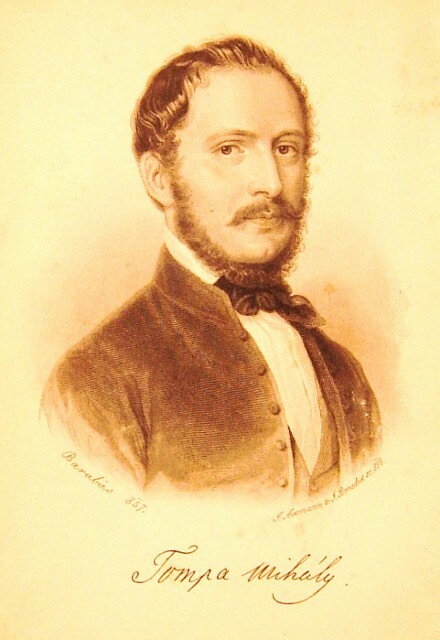 in Nagykőrös in 1852. Visited by Arany and family for month in 1855. Journeyed to Transylvania in 1856. Became member of Academy in 1858. Awarded Academy Prize for memorial poem on Ferenc Kazinczy (q.v.) in 1859 and its Grand Prize for his poems in 1868. Was Arany's guest in Pest in summer 1865. Health began serious decline in 1857. Went to Vienna in 1866 for medical attention to hypertrophy of heart. Important representative of popular and national tendencies in Hungarian literature. Transitional figure between romantic-sentimental and folk-national poetry. His narrative poetry considered inferior; allegories and elegies effective. Lyric poems often take form of reveries. Often praised for use of materials from nature. Major theme: death and transitoriness of life. First, and possibly greatest, success was achieved by collections of popular legends. Some of his poems have been translated into Arabian, Bulgarian, English, French, German, Hebrew, Italian, Rumanian, Russian, Slovakian, and Swedish.